I picked up a huge loaf of whole wheat bread and made up a bunch of French toast yesterday. As they came off the griddle I put them on a wire rack to cool, once they were cool I stacked the slices up with squares of parchment paper in-between the slices, popped them in a freezer bag and into the freezer. When you’re ready to eat them you simply take them out of the freezer and put them straight into the toaster. This morning the boys had them for breakfast and loved it! Any other fabulous breakfast ideas out there? brilliant! You can do the same thing with pancakes. I have never put them in the freezer, but if we have extra batter left over from the weekend I will cook it all up, put the pancakes in the fridge and then take them out and toast them for the kiddos for breakfast! What!?! You can put pancakes in the toaster!?! Game changer! Gray will be thrilled. I never make pancakes during the week. 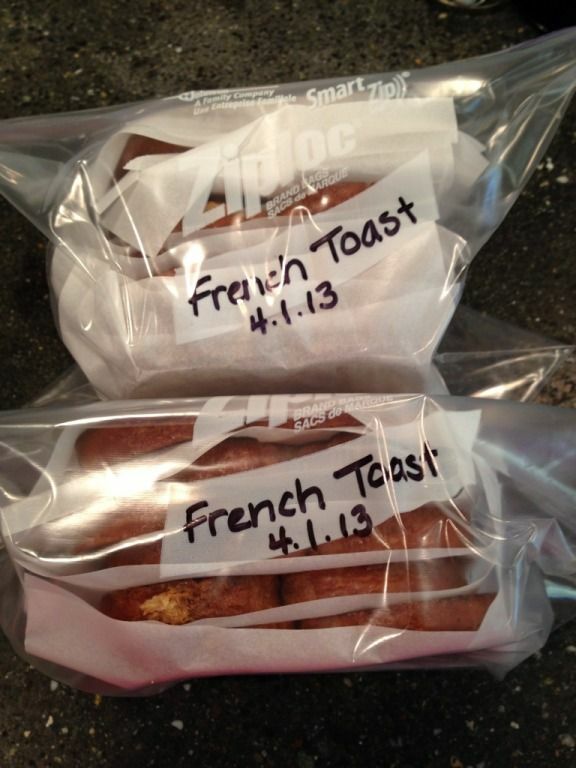 We freeze our french toast too! We also like the canned cinnamon rolls, we freeze the leftovers and pop them in the microwave for fast breakfasts/treats.